Any problem with the performance of your air conditioning system is an aggravation. You certainly don’t want to struggle along with inferior temperatures, excess moisture, odd sounds and smells, or elevated running costs. With a quick phone call to Provincial Heating & Cooling Inc, you can rest assured, your comfort will be restored by our Winnipeg air conditioning repair professionals. Founded in 1996, we’ve seen every type of cooling-related issue, and we know exactly what it takes to ensure your satisfaction. We don’t waste your time, inflate prices, leave you with mess, or surprise you with hidden costs. Through prompt, affordable, and skilled service, we resolve the most complex challenges, and leave nothing behind but a refreshingly cool home for you to enjoy. Have your A/C system repaired by a professional! 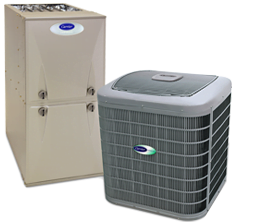 Contact Provincial Heating & Cooling Inc with complete confidence. Our team of technicians are fully licensed, insured, and NATE-certified. They draw from extensive industry resources and in-field experience, and provide a network of support you can always rely on. Whether you are in need of flexible scheduling or Emergency Service, we are on-call 24 hours a day, 365 days a year. Our fleet of fully-stocked service trucks are clearly identified, and provide access to a wide range of genuine Factory Authorized service parts. We arrive prepared to handle the scope of the job, always strive to lengthen equipment life, and complete the entirety of the repair in a single visit. By providing all necessary information, we help you make cost-effective decisions that will meet your expectations season after season. For trusted air conditioning repairs call Provincial Heating & Cooling Inc today! As a Carrier Factory Authorized Dealer, the HVAC specialists from Provincial Heating & Cooling Inc are trained at the highest level. We work on all makes and models, getting to the bottom of problems quickly and accurately. We consider each repair an opportunity to verify the safety, efficiency, and reliability of your heating or cooling system. Through a proactive approach and careful attention to detail, our AC repair specialists protect your lasting comfort. When home and business owners count on Provincial Heating & Cooling Inc for cooling repair, we respond with personalized attention, dedicated service, and solutions that live up to your highest expectations.